Just before we start our own New Year's Eve celebrations I would like to take a moment and wish you all, my dear readers, a very Happy New Year 2017! May it be filled with health, happiness, and love. New Year's Eve is gray, dreary and rainy here in San Diego, but I don't complain. As a matter of fact, it is a reason for great joy, since we have gotten more rain this winter so far than in the winters of the last couple of years. That may help us to get out of the severe drought. The rose bouquet on the table is composed out of flowers of rosa 'Madame Alfred Carriere', a Tea Noisette rose, freshly cut from my garden this morning. I casually arranged them in a simple wine decanter and love the informal look, which goes well with the blowzy, off-white flowers. 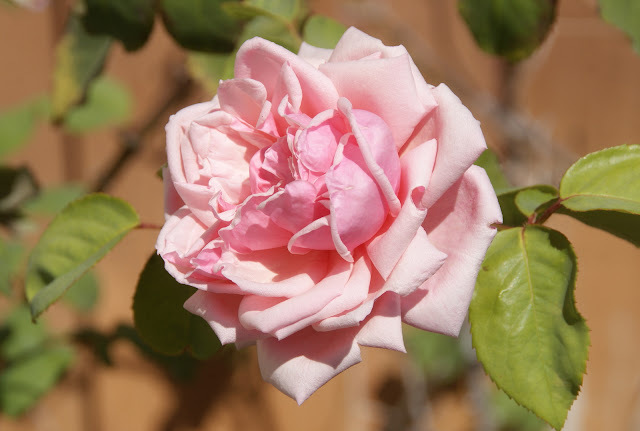 It is one of the great luxuries of living in the mild Southern California climate, that you are able to pick roses from your own garden at this time of the year. We don't get snow here, which I miss sometimes. To at least evoke the feeling of a real snowy, cold winter, I put this little vignette together. While I was shooting the photos for this post, I was encircled by the wonderful perfume of 'Madame Alfred Carriere'. I was surprised that the blooms smelled so strongly since outside I only recall a light scent, but somehow the warmth of the house brought the fragrance really out. I am so glad, that I cut these wonderful blooms to be enjoyed indoors. One of my New Year's resolutions is to bring more often fresh flowers into the house, so I am off to a good start already. Cathy from the blog 'Rambling in the Garden', who is hosting the well-known meme "In a Vase on Monday" has greatly inspired this intention. The beautiful bouquets, plonks or sometimes just single flowers that she and the other participants cut from their gardens are such a delight to see. 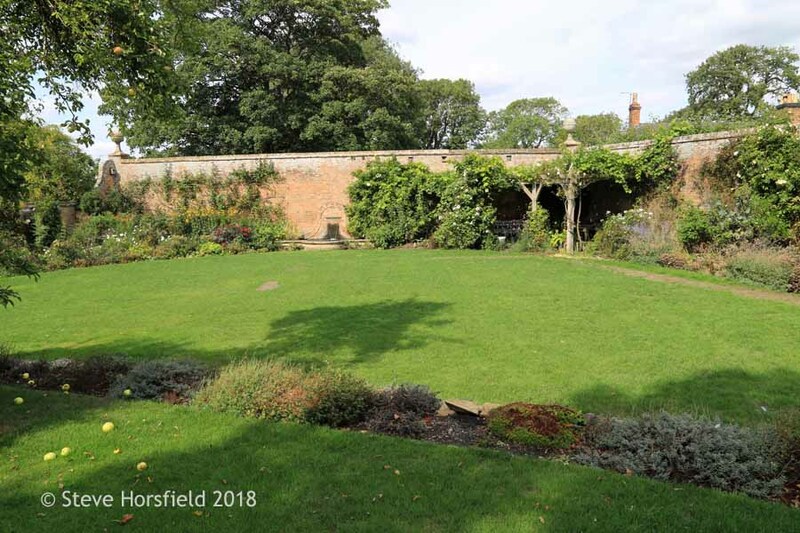 I will link this post to her meme on Monday (please, find the link at the bottom of this post) and encourage you to pop over and see what other gardeners found in their yards and brought into their homes in the first week of the New Year. This little white, ceramic, snowed-in house is really dear to me. When I see it, all I want to do is to cozy up with a blanket, a cup of tea and a good read in front of the warm fireplace. I hope you spend a wonderful New Year's Eve and ring in the New Year in the company of people that you love. My husband and I will stay home tonight together with our beloved dogs and will say hello to the New Year in a more quiet way. We had already a nice tea time with homemade apple tartlets and later on my husband will cook and I will be the sous chef. The little bubbly is ready and the white rose bouquet will move over to our dining room table and continue to delight us there! Many thanks for reading my blog this year. I would love to see you around in 2017 as well! 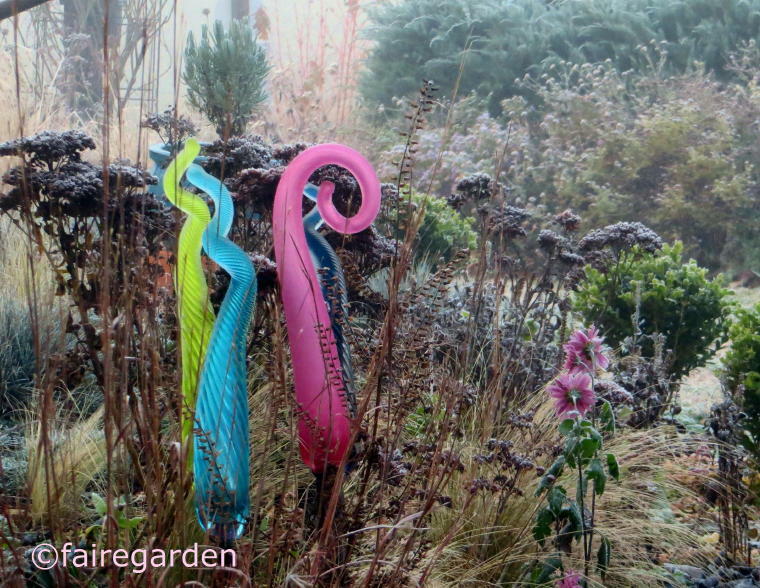 Looking forward to a (hopefully good) new garden year together with you! Dear Readers, I just would like to briefly pop in to wish those, who celebrate it a very Merry Christmas, and to all others a Happy Holiday 2016! Christmas came late to our house this year. Only yesterday I got the Christmas indoor lights out to bring a little Christmas magic and sparkle to our home and decorated a view simple vignettes, like the one above, which is on our dining room table. Yesterday morning, when we were shopping for our Christmas dinner, I came across these gorgeous, shiny, organic Arkansas Black Apples, which I had never seen before. I like to use natural materials in my decoration and I think they add such a festive touch and smell good on top of it. I acquired these dark brown wooden candlesticks at Goodwill in Albuquerque two years ago for a very reasonable price and I knew immediately that they would be perfect for autumn and Christmas decoration. I love the elegance of glass candlesticks, but these wooden ones add this earthy warmth to the table, that just makes you feel very warm, comfortable and cozy. A small Christmas wreath was perfect to beautify my old, white, decorative bird cage. A simple silver bow was all it needed. This vintage, small, brown transferware tureen made in England is a gift to myself this year. I think the delicate flower pattern is so pretty. My photos do the absolutely spectacular amaryllis flowers no justice. The color is a very dark, royal, red that matches the color of the apples perfectly. When I was taking the photos this morning, the sun came out and I placed the vase for a brief moment into the direct light, which brought the iridescent shimmering color of the flowers out. I am absolutely in love with them and hope that they will open a little more until tonight. I hope your Christmas day is going well and you have a chance to spend it surrounded by your loved ones. If you are celebrating it in a big group or in a more quite way, I am wishing all of you, that you have a wonderful day! Vintage & Co. - Let's Talk Vintage! The Last Little Garden Bouquet of the Year! 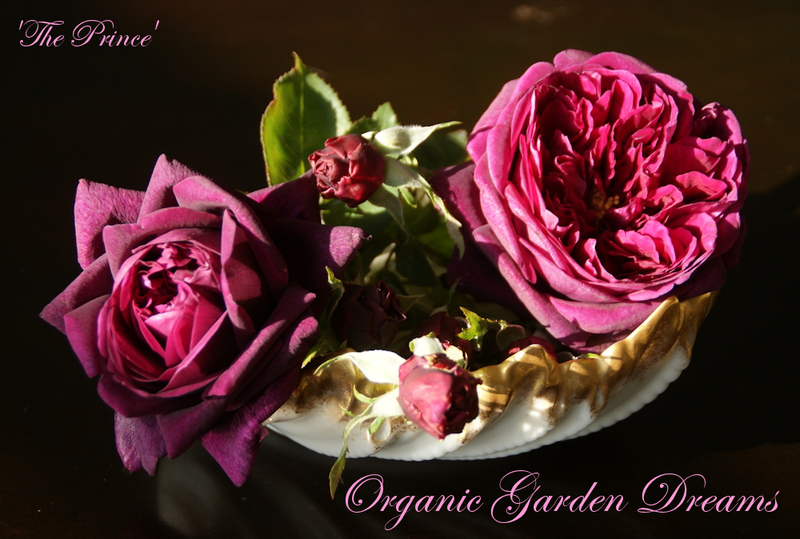 With no doubt my garden contains plenty of roses for its size, but not too many other cut flowers. I wanted to change this for quite a while and to make a start, I bought four dahlia tubers this year. Unfortunately, I got them into the ground way too late, in fact I planted them at the end of July (see my post about it here), and only two tubers made it and began to bloom after a couple of setbacks many weeks later. On Sunday of the Thanksgiving weekend I had company over for a little tea party and I went out into the garden to cut a little bouquet for the table. And there it was: The perfect dahlia bloom! I accompanied it by a few roses and some blue flowering ajuga and voila, I had my little bouquet together. I think it turned out so pretty, that even though I gathered it already about three weeks ago, I wanted to show it to you. So here is my little precious bouquet! It was a very overcast grey day, with not much light indoors. So I decided to photograph it outside on our garden table, together with some white baby boo pumpkins and my brown wooden candlesticks, that I got at a thrift store in Albuquerque, New Mexico. As you can see the little plonk contains only seven flowers. 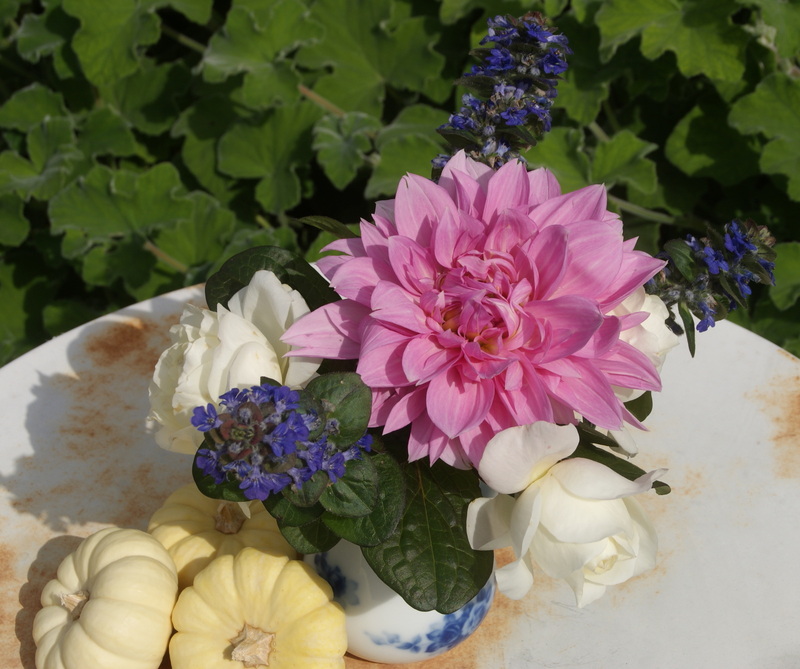 The dahlia is the centerpiece surrounded by three white roses and three blue ajuga flower stalks. In terms of floristic this certainly isn't a masterpiece, but I was and am quite happy about how it turned out. I have read somewhere that smaller bouquets are more pleasing to the eye when they contain irregular numbers of flowers and I find that to be true. I don't know how big the dahlia flower was exactly, but it was huge. The variety is called 'Lucca Johanna' and is described as a dinner plate dahlia, which simply seem to indicate that the blooms can get humongous. Even though I somewhat like these showstopper size dahlias, they can be a bit too much in your face and I think in the future I would choose a smaller variety. The blue flowering flower stalks are from ajuga reptans 'Catlin's Giant'. This ajuga really surprised me by doing super well even in our hot dry climate. I had bought six small pots of it and didn't get around to plant them into the ground immediately. It didn't take long and the plant decided to do the job for me by throwing out runners that rooted themselves into the ground outside of their containers. They have formed a patch of a good size by now. I looked it up and ajuga is related to the mint family, which can really mean trouble, since mint is so invasive here. But for now I am enjoying it. It is still flowering today and the flower stalks last a long time on the plant and in the vase. 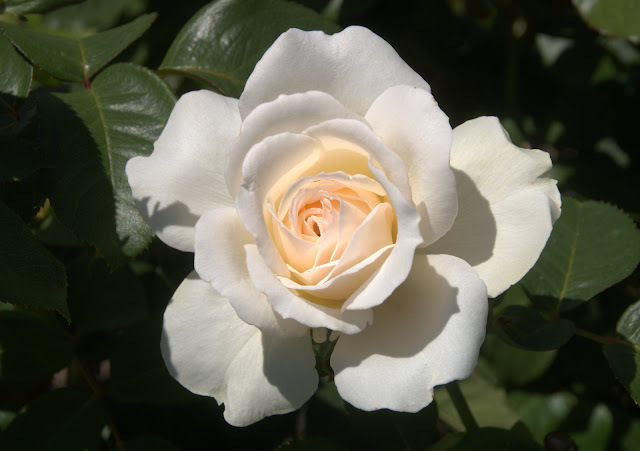 The name of the rose is most likely 'Moondance', a Floribunda. 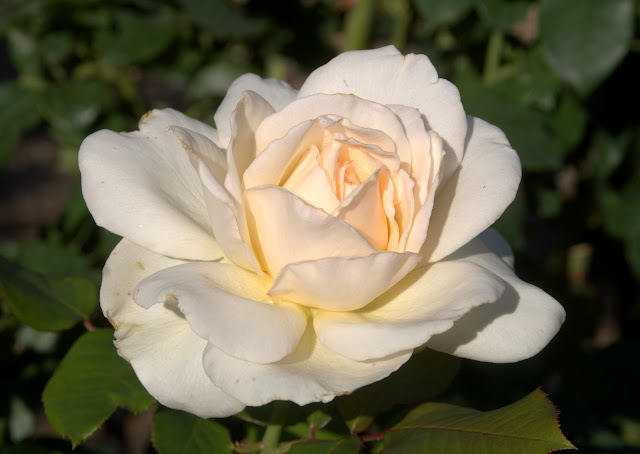 I ordered a 'Pope John Paul II' Hybrid Tea rose quite a while ago from Jackson & Perkins and they delivered a white flowering rose, but it was clearly not 'Pope John Paul II'. 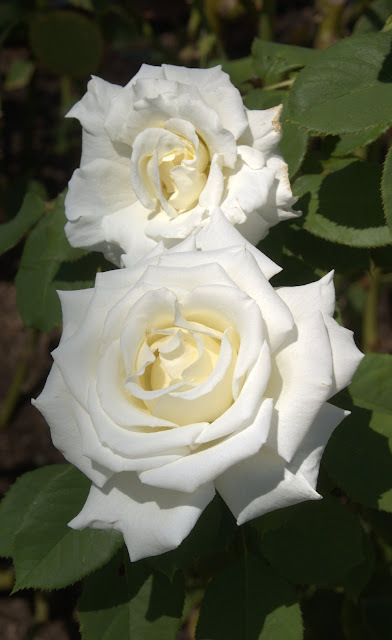 At the time of my order the only other white rose that looked somewhat similar that they had in their program was 'Moondance'. 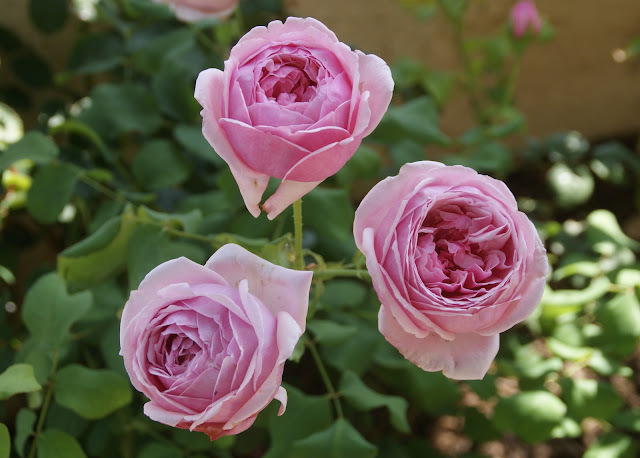 For that reason and because its looks matches the photos on HelpMeFind, I am fairly certain to say that this rose is 'Moondance'. So far I like it quite a bit. It is still only growing in a two gallon container and was profusely flowering for the first time this autumn. No blackspot or powdery mildew so far. Even though it was not the rose that I wanted, it might turn out to be a blessing that they sent me the wrong one. I like the yellowish center of 'Moondance' as it is opening up, since it gives the blooms this spectacular inner glow, that is fascinating to watch. ...and caused my little plonk to look even better. Brought indoors, this small bouquet truly beautified the tea table and made the tea time all the more enjoyable. Even though this is not the typically christmassy post appropriate for the season, I hope you still enjoyed it. Especially to those of you, who are snowed in and/or are suffering from the cold, I hope that my little plonk brought you some joy today! This autumn has been a very busy time for me, hence no blog posts for almost six weeks. I am always amazed how much I do miss blogging, when I don't get around to do it, I almost become a little cranky. 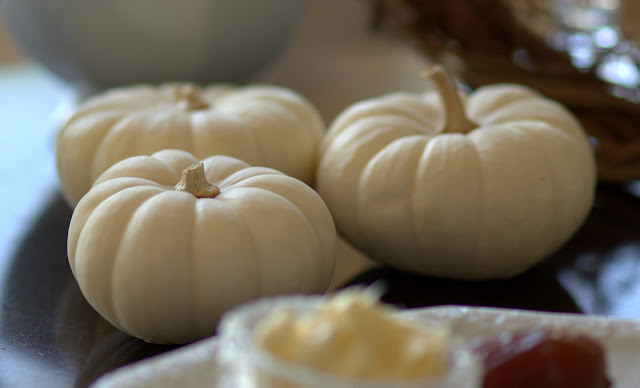 So I am happy that this Thanksgiving my husband and I have taken four days off, which gives me the chance to finally write a new post, again. Hardly anything is more calming and enjoyable for me than having a cozy tea together with my husband at our house and recently on a Sunday afternoon I felt that is just what I needed. I was in the mood for a little elegant autumn themed tea time. So I baked some fresh pumpkin-date scones and set the tea table really pretty with my best china, fine cutlery and other beautiful things that are dear and meaningful to me. Today I would like to share some photos with you of this special occasion. This is my little tea table set up in front of our fireplace. I think it looks really inviting with the candles lit and the warm California autumn sun shining on it and illuminating the scene. Just in case you wonder: Originally there were two tea place settings, one for my husband and one for me, but they didn't photograph well. So for the photo shooting we took one away, but put it back later after the photos were taken and when we enjoyed our tea together. 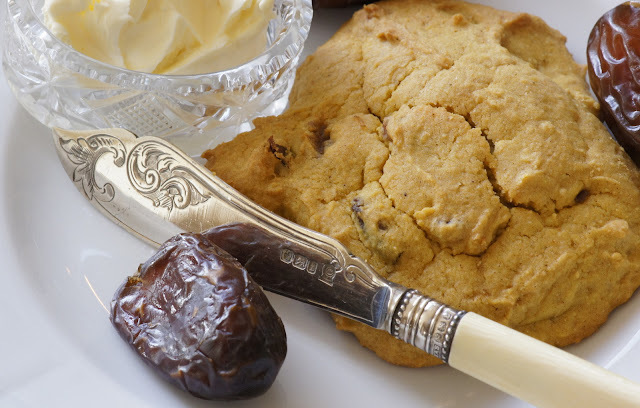 The recipe for the gluten-free pumpkin-date scones came from the September/October issue of the Tea Time magazine, one of my favorite tea publications. I am always looking forward to the next issue. When I was searching for a tea to serve with the scones, I found this pretty tea caddy in our pantry and thought it would bring some lovely autumn colors to the otherwise set in neutral tones tea table. This tea caddy was a gift from my husband to me, that he brought back from one of his many business travels to Japan and it contained a lovely green tea. The base color of the tea caddy fit very nicely with the white pumpkins that I put out as decoration as well. But I decided that a green tea was not the right choice to serve with the pumpkin and date flavors of the scone, so I opted for an organic Rooibos Chai that I had on hand from Numi Organic Tea. I prefer to drink it plain, but it is great with milk as well. The scones were ultra delicious with great flavors fitting for the season, but for some reason they didn't rise much. I wonder if I forgot an ingredient from the recipe? I will try to make them again and see if they turn out differently. 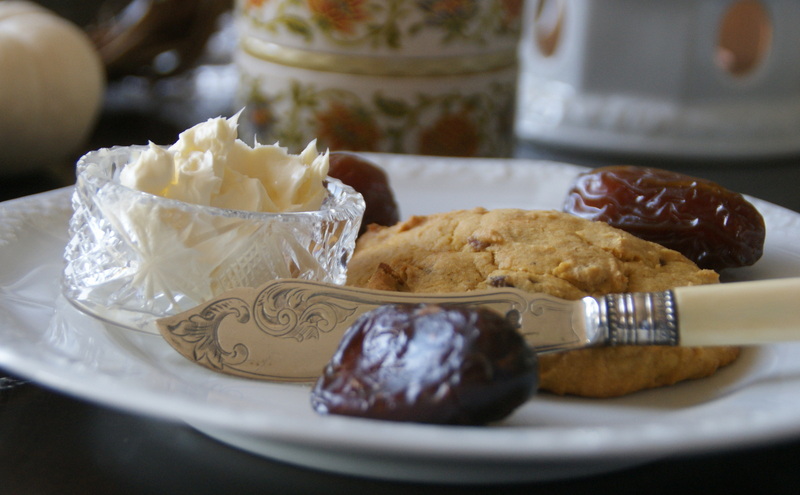 By chance I found my scone cutters that I bought on one of our travels to the UK after I baked the scones for this tea. I will use them the next time, which could also help with the shape of the scones. The scones were so good they could be eaten plain, but to make our tea even a little more special I indulged us with clotted cream. Usually I serve the clotted cream in a bowl that I place on the table together with a bowl of jam or lemon curd. This time I didn't need any of the other two classic condiments that scones are usually served with. 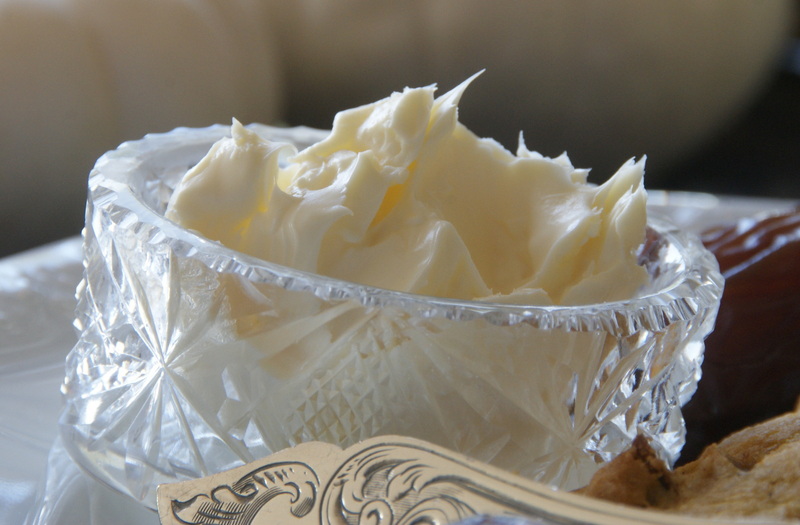 So I thought about a nice, stylish way to present the clotted cream on the table. Then suddenly I had an idea. How about using my recently acquired antique crystal salt cellars, the maker is Hawkes for you who are interested, as a vessel for the clotted cream and present them on the tea plate itself? I think it looks great and brings a very elegant touch to the table. You can never go wrong with some bling! The china that I am using is Rosenthal 'Maria Weiss', which I brought with me from Germany when we moved to the US. After so many years I am still in love with it, but I have to admit that I haven't used it much. I hope to change that in the future. What are pretty things for, if you don't use and enjoy them? There is a practical reason though that doesn't help to get this china out more frequently: I insist to wash it by hand. As many of you know the dish washing detergent for the dish washer is quite destructive to the glaze of china and this porcelain set is way too precious to me to be exposed to that harsh treatment. Rosenthal 'Maria Weiss' creamer and sugar bowl. 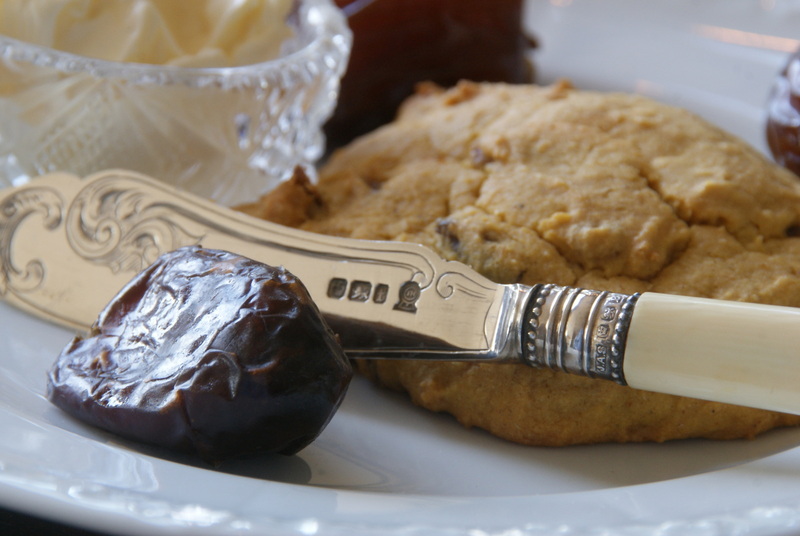 Another very dear to me item on this tea table are the Victorian knifes. They are also from England, we bought them in an antique shop over there. And no, they were not a steal, but they are so beautiful that I just had to have them. When I look at them I always think of Victorian ladies, elegantly dressed in lacy, white clothes. Details on the blade of the knife. It feels very touching to me that someone put the love and detailed work and great craftsmanship into these (butter-)knives to make them as pretty as they are. Nowadays it is very rare that efforts like this are made to simply create something beautiful that generations to come can enjoy. Showing you these photos and writing the text almost feels like I am having tea with you, my dear readers, it just brings me a little closer to you and I hope my post invokes mutual feelings in you as well. I truly wish it would be possible to share tea with you in reality, but at least we can do it over the internet and who knows maybe we meet one day in person and I can invite you for tea for real! I hope that everyone who celebrated Thanksgiving had a wonderful, peace- and joyful Holiday surrounded by friends and family. Maybe you find some time this weekend to slow down and enjoy some tea time yourself. Elegant or simple, it doesn't matter, it is always such a lovely treat to brighten up the day. Thanks for stopping by! Your visits and comments are making blogging always worthwhile and so much fun for me. 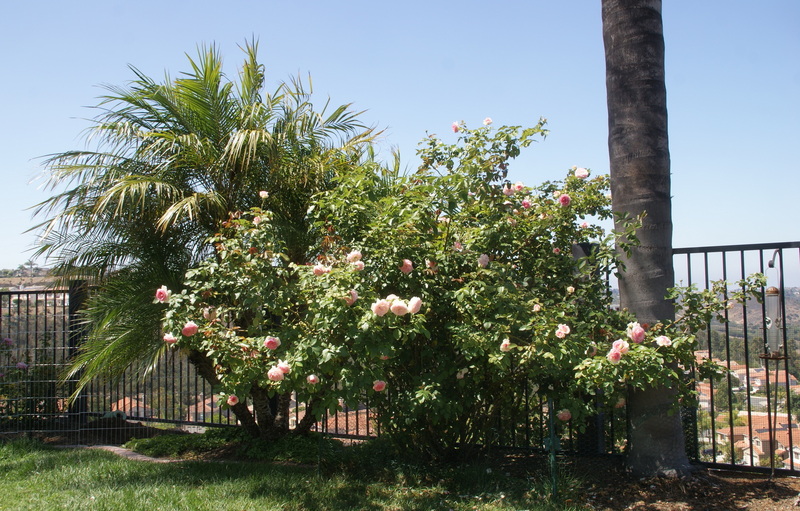 September was partly very hot this year here in San Diego inland and the roses struggled with the high temperatures and the low humidity and weren't really in a blooming mood. Add to that, that I was out of town for two weeks last month and it comes as a surprise that I was still able to take enough pictures worthy to be posted in my September Roses post, but here it is! This is 'Koko Loko', one of my new ownroot Floribunda roses of this year. I think the brown blooms (yes, they are really of that brown color!) are absolutely stunning and very unusual. It would be lovely to use them in autumn bouquets, but my bush is still very little and I think I have to be patient and wait with that until next year. I love this picture of the still tight rose bud. 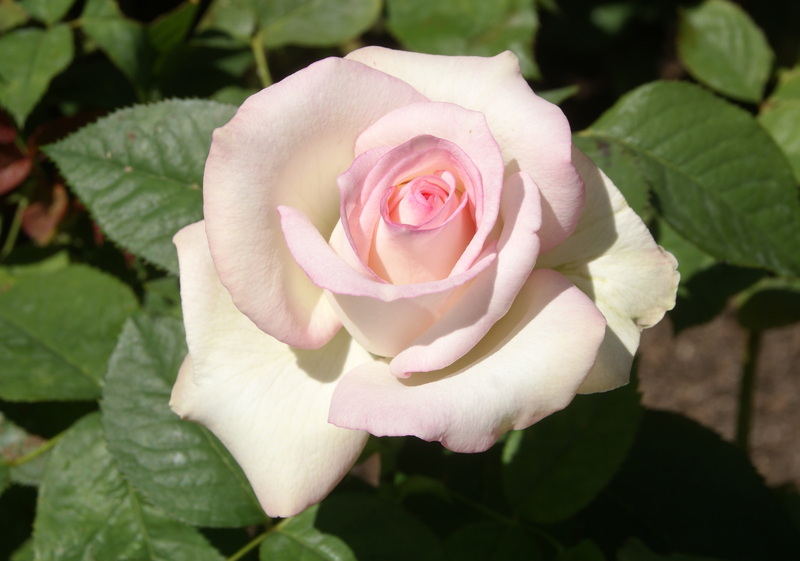 Here is a fully opened flower of 'Koko Loko', where you can truly see the milk coffee like color of this rose. I am really looking forward to seeing this bush maturing and (hopefully) producing tons of these awesome blooms. So far the rose is healthy and growing well. It is not overly vigorous, but it is also not a puny plant either, which you can easily get with these odd ball colors. 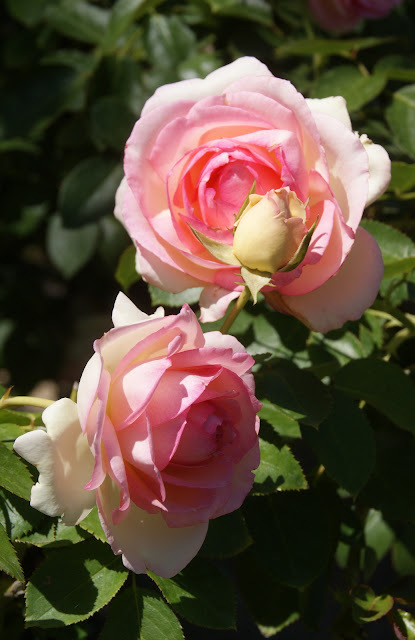 'Auckland Metro' is a stalwart in my rose collection, on which I can really count on. I never get tired of this "inner glow" that this rose has. Over the years rosa 'Pierre de Ronsard' has become really humongous. The dimensions of this rose are really hard to see in this image, but just have in mind that the fence is six feet tall. Maybe that gives you a more clear idea of the size of this bush. For September the rose has been able to produce yet another decent flush. This is even more astounding, since I didn't get to fertilize it again after the summer flush. 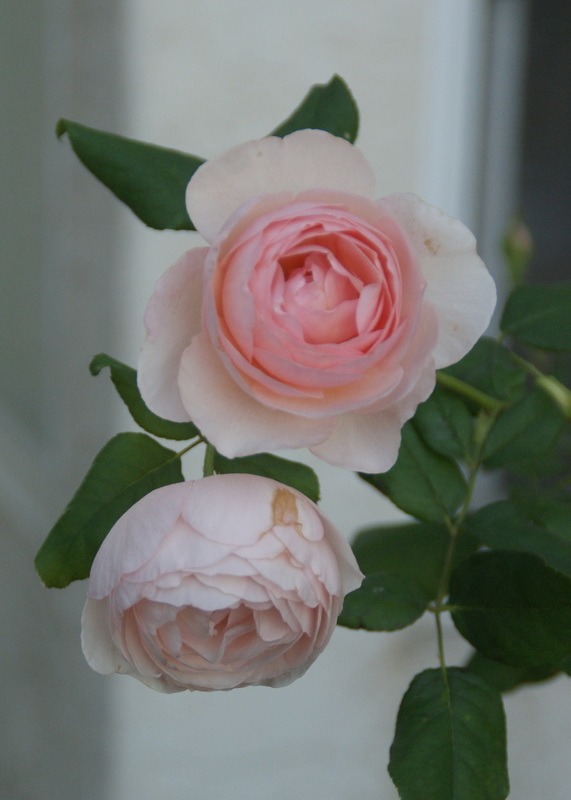 Close-up of the blooms of 'Pierre de Ronsard'. Rosa 'Pope John Paul II', another very reliable and much loved rose in my garden. A rose which had a fantastic year so far is 'Pretty Jessica'. I find her globular blooms so endearing. 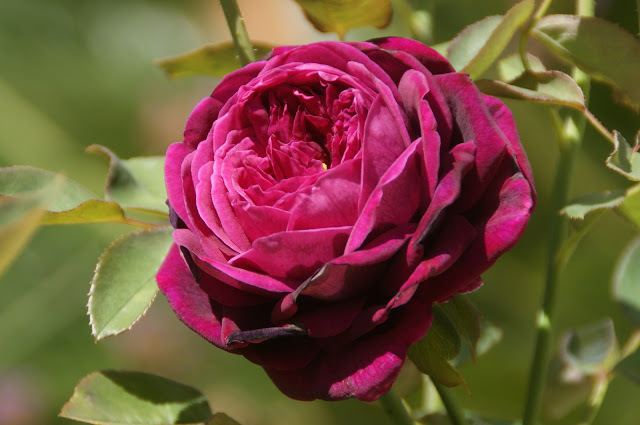 With rosa 'The Prince' I have a love/hate relationship: I love the color and outstanding fragrance of the blooms, but I hate the mildewed leaves, that this rose often gets in my garden. Unfortunately, rosa 'Captain Christy' is still just a very puny bush in my garden and simply doesn't want to get stronger. I tried to pamper it in a big terracotta container, but nothing seems to help. Still the elusive, shell pink blooms make me want to try somewhat longer with this rose. 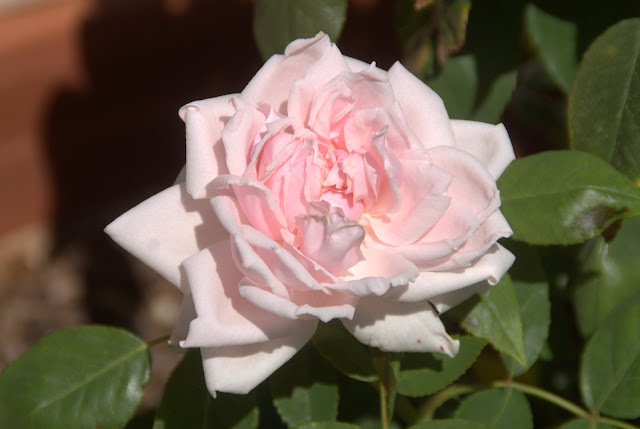 The unusually colored globular blooms, the health of the bush, the amount of flowers that this rose is able to produce with each flush and the strong pleasant fragrance make 'Charles Darwin' one of the best roses that I grow in my garden. ... and the constant color changes that come with different temperatures make this rose always interesting to look at. Rosa 'Rhodologue Jules Gravereaux', a very nice Tea Rose in my garden. Don't you just want to grow it for its beautiful and romantic name alone? A rose which is characterized by its particularly beautiful and large flowers: Rosa 'Chandos Beauty'. This rose has one bad habit for me. In autumn it produces many very long canes that don't bloom, so called "blind shoots". 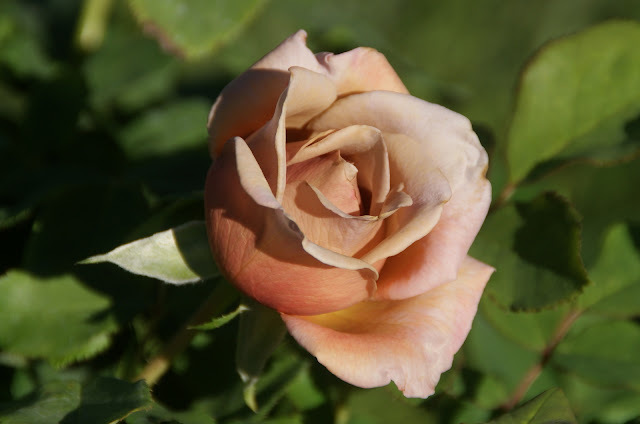 I have no idea why, since I treat it the same way like all my other Hybrid Tea roses that don't show this phenomenon. It must have something to do with my climate. 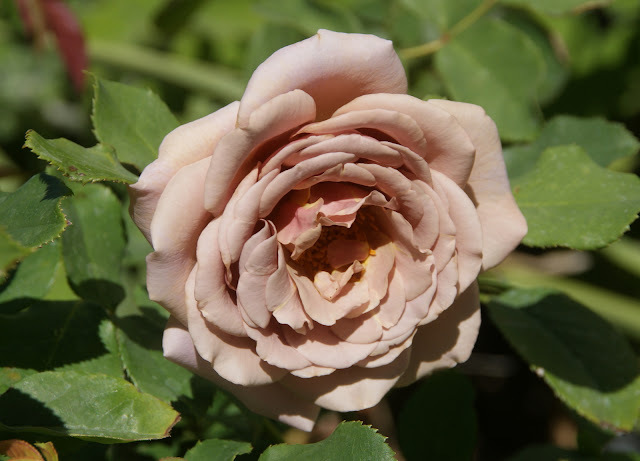 Rosa 'Heritage' has also started to bloom again and is churning out her delicate soft pink blooms. 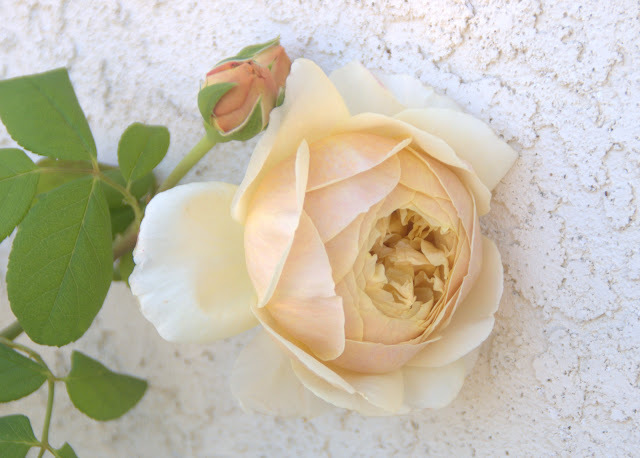 The beauty of this rose is undeniable, but it is very fleeting. The flowers can drop their petals when it is hot within one day. And this is not an exaggeration! Last but not least a perfect bloom of 'Moonstone'. 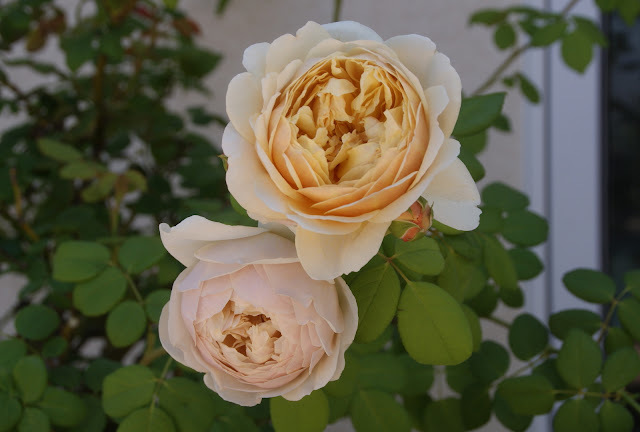 Whereas previously on my blog I passionately defended roses from the title of being difficult primadonnas, this rose fully deserves it. You get incredible beautiful and perfect blooms when the rose is in the mood, but also a mildewy, sickly mess when it is not. Hope you are able to slow down a little bit, enjoy the autumn and still sniff some roses here and there. 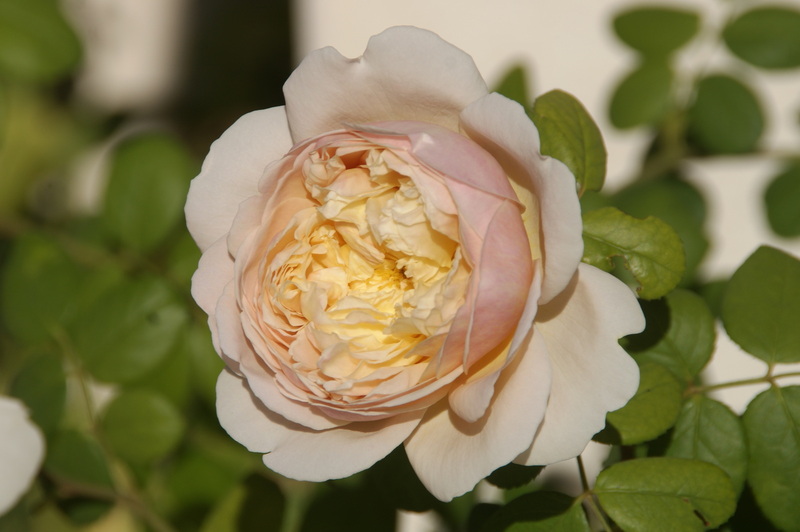 In case the roses are still flowering in your garden, which varieties are good autumn bloomers for you? Would you care to share? Please leave a comment, so that we rose lovers can all learn from each other. Many thanks!